In the early 1600's, the Dachshund originated in Germany. They were bred to hunt badgers and rabbits and other small game. They have small legs so that they can follow game into their burrows. Their population dwindled during World War I but they were imported from Germany to the USA and their gene pool once again increased. 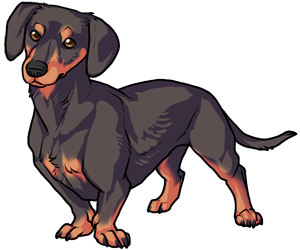 * Dachshunds were bred to hunt badgers and rabbits. * Smaller variations were bred to hunt hare and stoat. * The Dachshund was recognized by the AKC in 1885.